Monarch Air Group provides private air charter in Seattle, WA. Our clients benefit from top-notch service, unrelenting dedication to safety, wide selection of aircraft, and years of experience in chartering private jets. To obtain a free quote, please use our online quoting tool provided below, or call toll free 1-877-281-3051. 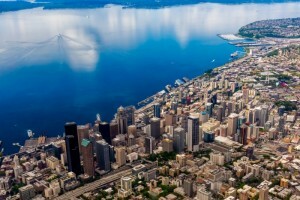 Seattle is the largest city of the US state of Washington. It is a vibrant city, well known for its Seattle Space needle. Seattle is encircled by the Elliott Bay, Lake Union, Lake Washington, Mount Rainier, the Olympic Mountains, and the Cascade Mountains. It has many cafes, farmers markets, beautiful museums, theaters, concert hall, luxurious restaurants, such as SkyCity restaurant located at the top of the Seattle Space Needle. 1. BFI, Boeing Field/King County International Airport, Seattle, United States. 2. CLM, Fairchild Intl, Port Angeles, United States. 3. CWS, Center Island, Center Island, United States. 4. ESW, State, Easton, United States. 5. GRF, Gray Aaf, Tacoma, United States. 6. KEH, Kenmore Air Harbor, Kenmore Air Harbor, United States. 7. LKE, Kenmore Air Harbor SPB, Seattle, WA, United States. 8. LPS, Lopez Island, Lopez Island, United States. 9. MVW, Skagit Regional, Mount Vernon, United States. 10. NUW, Whidbey Island NAS (Ault Field), Oak Harbor, United States. 11. ODW, Oak Harbor, Oak Harbor, United States. 12. OLM, Olympia, Olympia, United States. 13. OTS, Anacortes, Anacortes, United States. 14. PAE, Snohomish County, Everett, United States. 15. PUL, Poulsbo, Poulsbo, United States. 16. PWT, Bremerton, Bremerton, United States. 17. RNT, Renton, Renton, WA, United States. 18. SEA, Seattle-Tacoma International, Seattle, WA, United States. 19. SHN, Sanderson Field, Shelton, United States. 20. SQV, Sequim Valley Arpt, Sequim, United States. 1. Hotel 1000, 1000 1st Avenue, Seattle. 2. Coast Hotels Paramount, 724 Pine Street, Seattle. 3. Grand Hyatt Seattle, 721 Pine Street, Seattle. 4. Camlin Hotel, 1619 9th Avenue, Seattle. 5. Mayflower Park Hotel Seattle, 405 Olive Way, Seattle. 6. Alexis Hotel, a Kimpton Hotel, 1007 1st Avenue, Seattle. 7. Best Western Pioneer Square Hotel, 77 Yesler Way, Seattle. 8. Sorrento Hotel, 900 Madison Street, Seattle. 9. Doubletree Arctic Club Hotel, 700 3rd Avenue, Seattle. 10. Best Western Pioneer Square Hotel, 77 Yesler Way, Seattle.